This document provides background information on the process of creating a new KB document. It also includes a training exercise that demonstrates the document editor's basic functionality. For detailed information about specific aspects of the document editor, please continue with this training series or return to the KB Author Training - Overview. 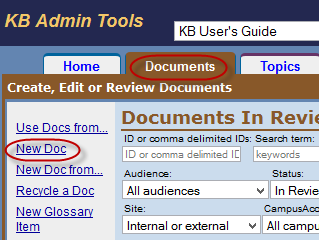 In the KB Admin Tools, click on the Documents tab. Click on the New Doc link in the left navigation bar. You will be presented with the document editor, all fields will be blank. (Please note it says "Creating a New Document" at the top of the screen). 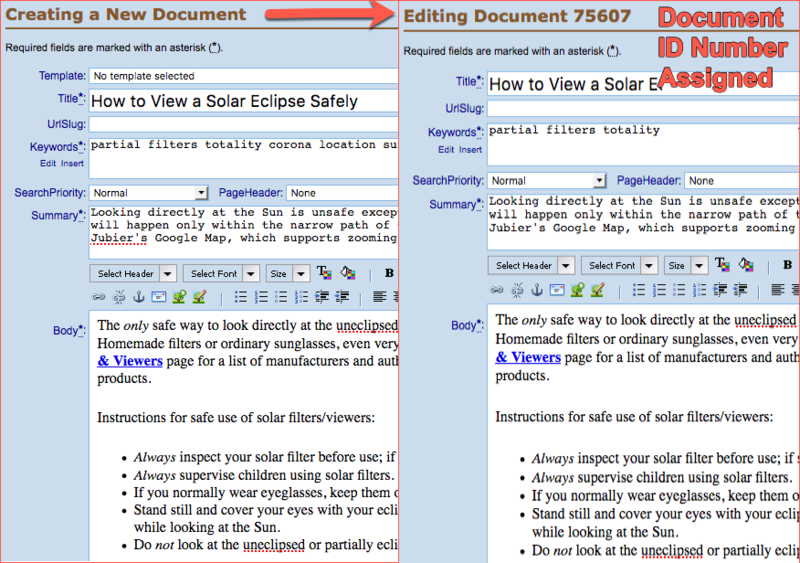 Before you can save your new document, you must enter text in the required fields: Title, Keywords, Summary, and Body. 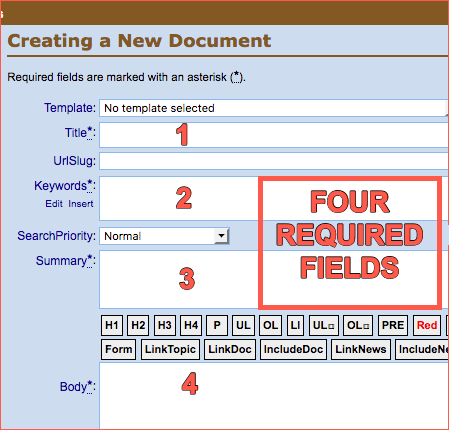 These four fields represent the absolute minimum of information that must be present in a KB document. As you are working, click the button located under the Body field to periodically to save your changes. Since this is a brand new document, once you click on the Save Change button, the Creating a New Document header will become Editing Document XXXXX. The status of this document changes from New to In Progress. In the image below, the left side shows a brand new document with content in all four required fields. The right side of this image is what you see after clicking the Save change button: the new document, or "draft", is saved and assigned its own, distinct number, 75607. *Note: Observe how the Template field (which appears on the left, in the image below) disappears (as seen on the right side of the image below) once the document is saved / assigned a distinct number. Please refer to this document for more information about Templates. Save, Save, Save Your Work! ...you will lose all content since the last time you saved. While the KB does keep a copy of all your revisions, it is necessary to tell the KB to save by clicking on that Save change button. To review: from the Creating a New Document screen you have completed, at the very least, the four required fields of Title, Keywords, Summary and Body. By clicking on the Save change button or the Submit button, the "Creating a New Document" at the top of the screen has been replaced with Editing Document XXXXX . The number is called the Document ID number. The In Progress indicates the status of your document. Please make note of this Document ID number. 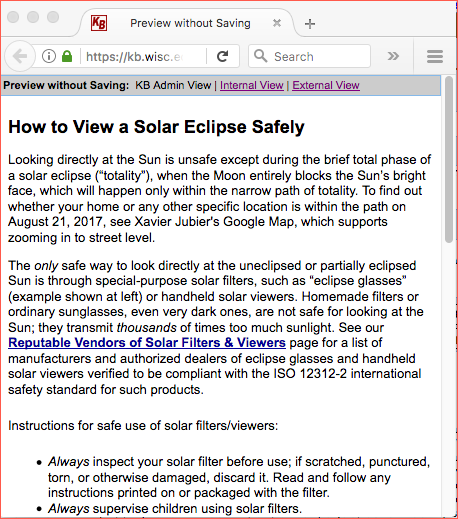 While you are modifying the content of your document, you can preview the document without saving to make sure it looks as you expect it to. To preview a document, simply click the button under the Body field. Click on the X in the upper left corner to exit the Preview without Saving window. The image below shows our sample document in the Preview without Saving pop up screen. in order to either notify your KB Admin that the doc is ready to be published or to publish it yourself (depending on your have Publish rights). The Site Access field allows you to publish a document to one or multiple KB sites. Determine who the audience is for your document and select at least one KB site. To set the document to the status of Active, at least one KB site must be selected. The image below shows that the document is accessible only by the Internal site and NOT by the External site. 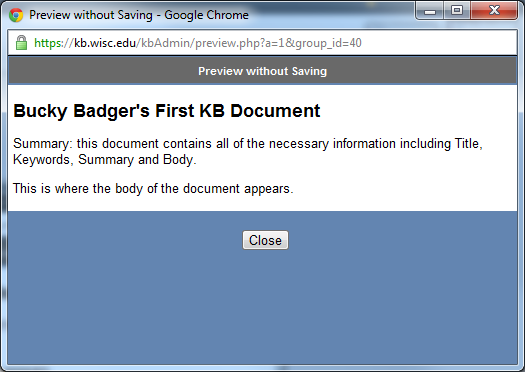 Only the Active status will make the current draft of the KB document available on your live KB Site. The process of making the document available is generally called 'publishing the document', 'activating the document', or 'making the document live'. Note: Remember, when you are first creating a new document you will need to save the document at least once before you can set the document to Active status. Use of the In Review status varies from group to group. Some groups use 'In Review' as a holding bin for documents that are ready to be reviewed by another person before being activated for the KB Site. Please see KB User's Guide - Documents Tab - Document Flow Chart to see the life cycle of a KB document. Log into the KB Admin tools for your KB site. Open the document editor to create a new document. Enter the following Keywords (separated by commas): apple, banana, orange, pear, zucchini. Enter the following Summary text: "Summary: this document contains all of the necessary information including Title, Keywords, Summary and Body." At this point, try clicking Save change button. You should receive an error message indicating that Body is a required field. Click 'OK' to exit the error message. Enter the following text into the Body section: "This is where the body of the document appears." Click the Save change button. The text at the top of the document editor should now read "Editing Document [Document Number]". Record the document number for use in subsequent training exercises. Click the Preview button. You should see something a document very similar to this. Note that while the Title, Summary, and Body text you entered is visible, the Keywords (which help label the document with potential search terms) are hidden. If your page does not resemble the example, try working back through the steps of the exercise to determine where the discrepancy lies. To avoid cluttering your Live KB site with test documents, do not set the document status to 'Active' at this time. The saved the document defaults to In Progress status.